Sara Ludy, Nest 1, 2018, Waken Glass and copper mesh, 4 x 8 x 7". A pamphlet for “Unearth,” Sara Ludy’s second solo exhibition here, wields the lingua vacua of corporate innovation, inadvertently upping the show’s uncanniness. “We said, let’s experiment, be intuitive, be bold, embracing the unknown,” the artist is quoted as saying. 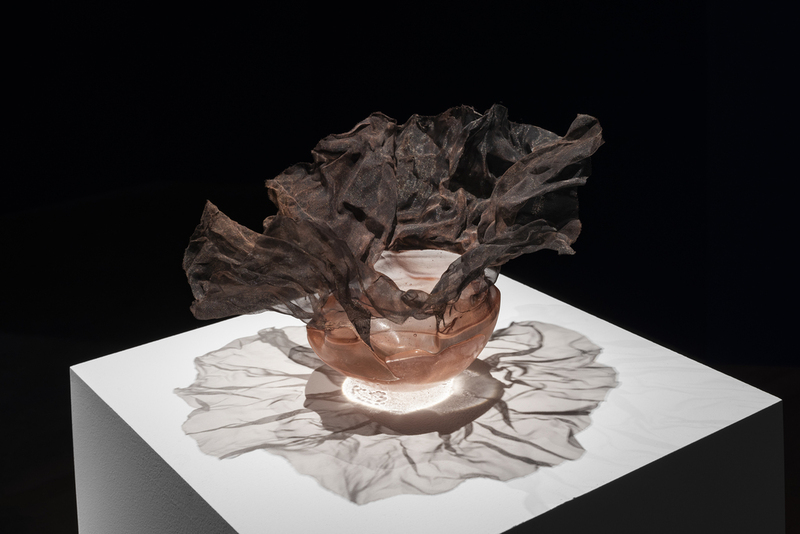 Things click into place when you learn that the exhibition’s showcase material, a metal-glass hybrid dubbed Waken Glass, was developed by Upterior, a startup that partnered with bitforms gallery and Ludy for the show. Waken Glass’s patent, like our own extinction, is pending. With this medium and a couple of others, Ludy has devised an “aviary,” a sparse room birdlessly poised at the intersection of sponcon, simulation, and what some still call real life. Its glass components evoke display screens; its copper parts the metal cables that invisibly facilitate our online presences. The brittle, transparent forms of Nest 1 and 2, 2018—clumps of copper mesh in bowls of rosy glass—suggest fowl, but also mourning veils, alien pods, the ocean. By the entrance dangle two vacant Waken Glass pieces from the series “Perches,” 2018—their crumpled, singed metallic screens droop like bike streamers, deadened by lack of wind. Ludy plans to scan these models into her “virtual world,” which will be inhabited with bird visualizations. Trough 3, 2018, is a video hosted on a flat screen and at birdsmadeearth.com (a website created by the artist), which features a usually blank sky livestreamed from a Chicago high-rise: an urban spin on wildlife webcams. Nearby hangs Refract, 2018–19, a digital print that looks like a kaleidoscopic image made with quartz shards and insect wings. Ludy’s soundless, hollowed habitat prods us to ideate nature—which is to say home—in an age of coterminous virtual and physical space, allowing us “to see the world not for what it is, but for what it could be,” according to an unattributed source from the aforementioned pamphlet. In the end, we decide whether her aviary is a sanctuary or a cage.